If you want lower stomach workouts that really burn your stomach muscles, try adding marching while lying on a stability ball to your stomach workout routines. 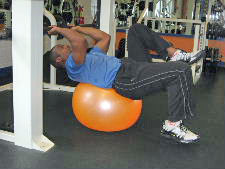 The stability ball can significantly increase how hard your stomach muscles work during stomach exercises. The exercise below is an advanced exercise for the stomach, so you should build up to it and always listen to your body. This exercise is not recommended for beginners. To prepare yourself for this exercise, you can try ab crunches with your feet up on a bosu ball to build up your stomach strength. The stomach exercise below is an advanced exercise, so you should build up your strength before trying it. In order to do this exercise you must find something stable to anchor your upper body. If you don't use something that is very stable, there is a higher chance that you can fall and injure yourself. Also, inspect the stability ball to make sure there are no scratches or holes that may weaken the ball, and remember that this is a really advanced exercise that should only be attempted by people who already possess great core strength. Starting Position: Lie on a stability ball and secure your upper body. Bring your feet up so that your hips are at 90 degrees. Form: Engage your stomach muscles, and then slowly lower one foot towards the floor. Gently touch your foot on the floor and then bring that leg back up to the starting position. Then, lower the opposite leg towards the floor. Keep alternating your legs in a marching motion. Personal Trainer Tips: The key to this exercise is to focus on slowly lowering the leg towards the floor. 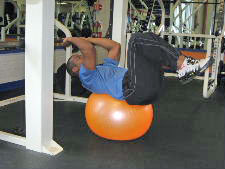 If this is too challenging, you can just hold the first part of this stomach exercise on the stability ball. Once you master this exercise, you can move on to reverse crunches on the stability ball. Listen to your body and stop if you feel any discomfort in your lower back. Include other exercises that emphasize the lower stomach, to create the best lower stomach workouts. Read the page on lower abdominal and lower stomach exercises, to learn more tips for lower stomach workouts.